Open Show - Untitled Danes Only with special class for Danes that have already been titled. 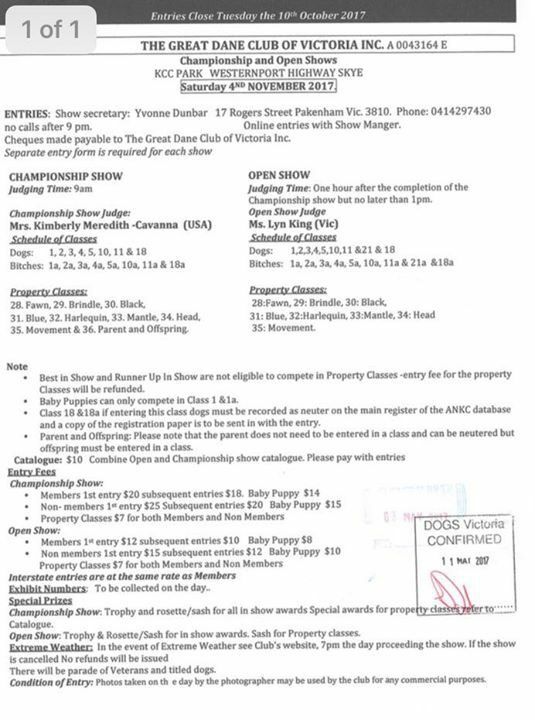 Anyone handling throughout the show for whatever reason (including Veterans Parade) must be a member of Dogs Vic (or their States equivalent). During the day there will be a Parade of Veterans (see below), Champions, Grand Champions and other titled Danes - who must have qualified before the close of entries. Proof is to be submitted of title achieved. Don't forget when entering your dog at our up and coming Veterans parade you need to submit a copy of your pedigree (for proof of age). Dogs must be a minimum of 7 years of age to qualify. photographer may be used by the club for any commercial purposes. In the event of Extreme Weather see Club’s website, the preceding day of the show.